Great price for this Colorado River Resort! Come experience vacations the whole family will enjoy! Floating week! Inquire for more details! 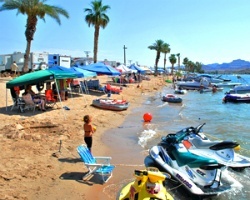 Get ready for the very best in RV campground adventure with *Colorado River Adventure Deluxe RV Campgrounds*! There are 10 Colorado River Adventure Deluxe RV Campgrounds (many with camping cabins and units available for a nominal fee). Most of the resorts are located in California with one in Mexico and three in Arizona, and are designed to give you the very best possible RV camping experience! Each RV park is packed with family vacation adventure activities to keep both the young and the young at heart entertained! For more information, visit www.coloradoriveradventures.com. *Outstanding Campground Opportunity* Featuring scenic RV and tent campsites and some optional cabins. Usage is annual in floating weeks. For more information or to make an offer, please submit the inquiry form.